That change in the air from the humidity in Northern NSW to the ever so slight chill and ‘freshness’ of a new season. It is my favourite time of year with mild days of sunshine (and currently almost daily showers of rain in this 2012 Autumn) and the shorter days leading into winter. Although where I live winter is usually made of days generally between 18-24 degrees Celsius with the odd cold day of around 14, so it is hardly unbearable. Autumn also is a season of flowering for many Banksias. Banksias are named after Sir Joseph Banks the intrepid naturalist who accompanied Captain James Cook on the HMS Endeavour in the 1768 – 71 and their journey and first contacts along the east coast of Australia, including the first exploration of Botany Bay with all its exciting, amazing new flora and fauna. I can imagine Sir Joseph gasping with delight at all these amazing and to his European eyes, weird and wonderful discoveries! The State Library of NSW has his original journal from this amazing journey and you can read it online here. 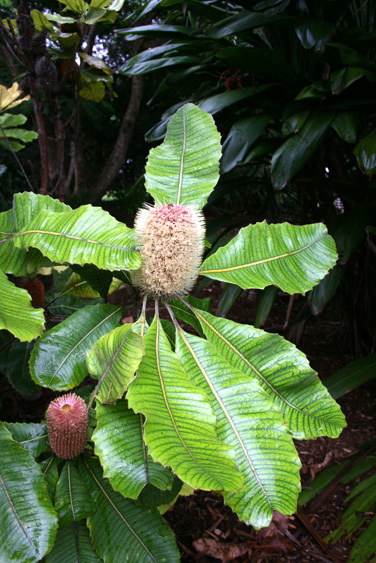 Above is the Coastal Banksia – Banksia integrifolia – this is a common species on the east coast of Australia. 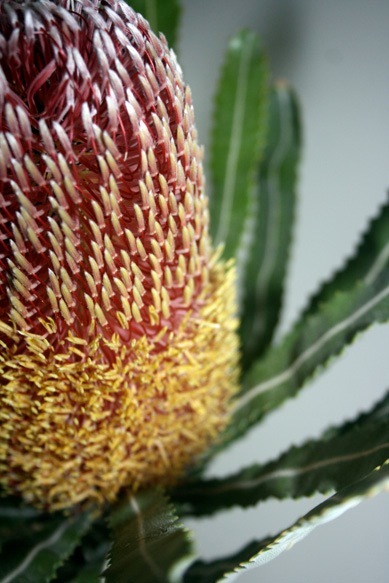 There are about 75 species of banksias with all but one endemic to Australia. 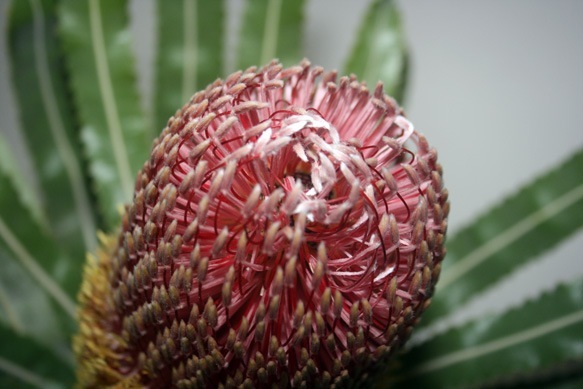 These gorgeous cone-like architectural flowers come in many sizes, shapes and colours and are a major source of nectar for many of the native wildlife including birds, bees, and possums. In fact we have a little family of possums that live in and around our garden – most evenings you can hear their calls, and sometimes the screeching of their babies! I do wonder if they find our small collection of banksias (but I have planted more in recent months) – I know they have found the Davidson plums! 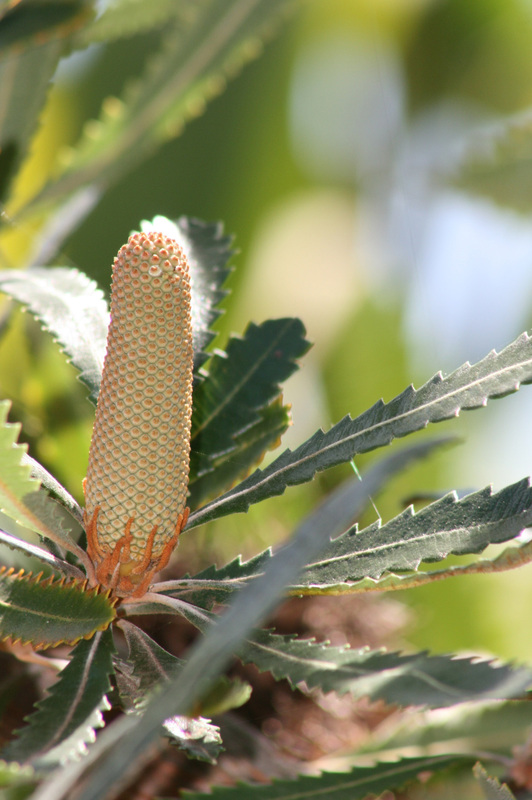 Above is the tightly woven ‘cone’ before it bursts forth – Banksia serrata – Saw Banksia or Old Man Banksia. 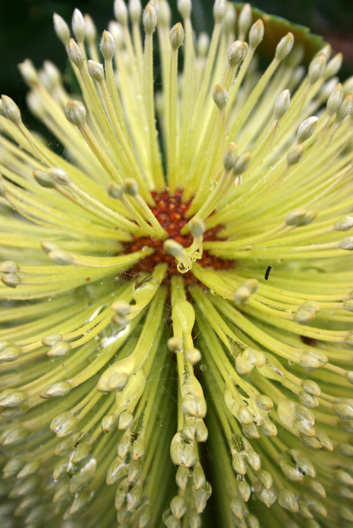 Below is the open flower spike of the Banksia serrata. Above is the spectacular local banksia – Banksia robur – Swamp banksia with its brilliant large leaves. These flower spikes change colour the more open they become from green through pink to the final cream flowering. 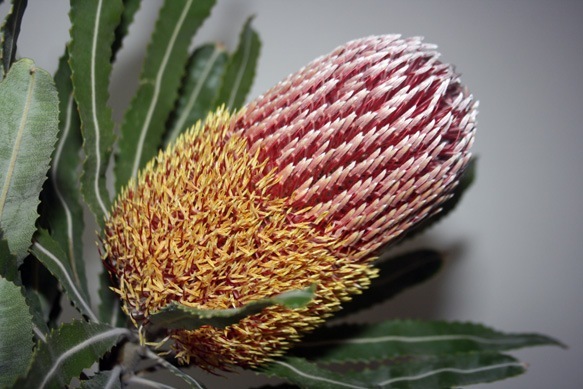 The Australian Native Plants Society has some great information about Australian flora including banksias. One day I would love to visit Western Australia – I often check out airfares but this trip will have to wait a while yet, but when I go I definitely want to spend some time at the Banksia Farm. 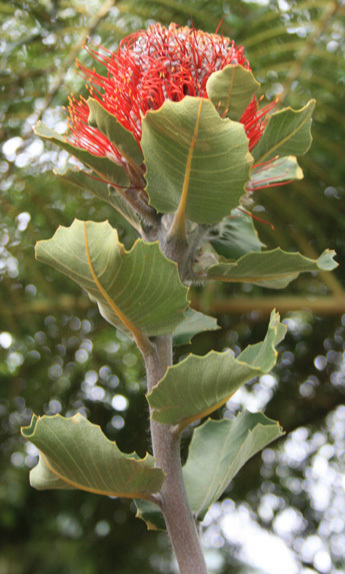 The Western Australian Banksia coccinea – Scarlet Banksia or Waratah Banksia. This is one I bought from a florist – just gorgeous isn’t it? Banksia menziesii – Menzies’ banksia or Firewood Banksia is a beautiful Western Australian banksia that can grow up to 10m tall. The closest I can get to these amazing plants in the wild is at the local florist shop. 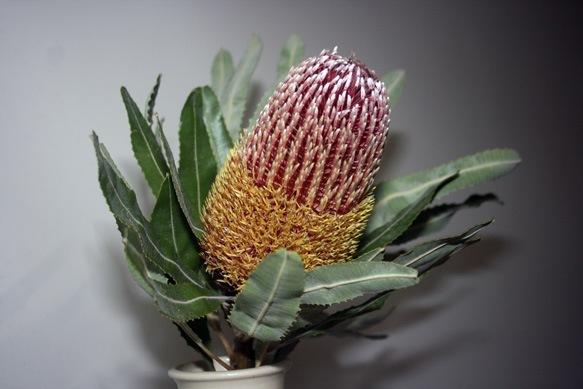 Banksia menziesii is a striking wildflower used by florists. 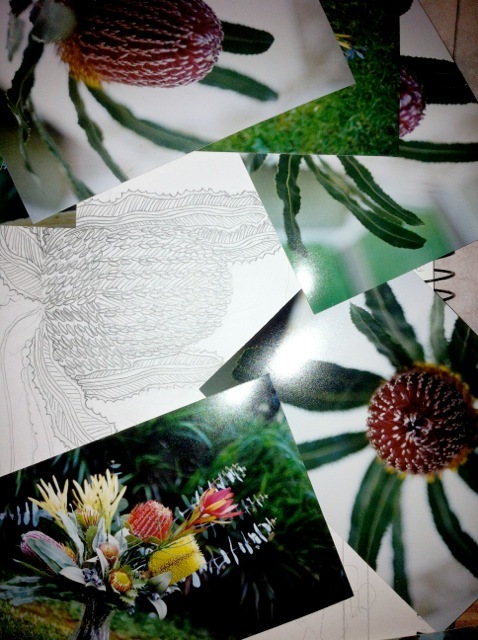 I am currently working on drawings for new designs for greeting cards including a design using Banksia menziesii. I am using both photographs and the actual flowers as reference points for the designs. That swamp banksia looks like a painting waiting to happen! Thanks for the intro to these interesting plants. 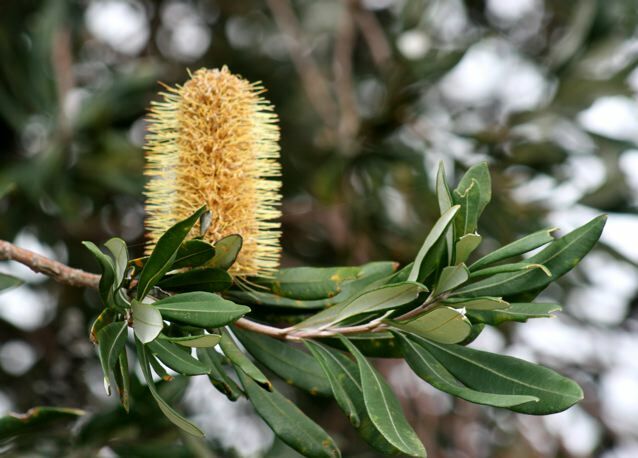 Love the Banksia robur – it is outside my studio window! The leaves are wonderful & sculptural – need to get back to doing some more drawings I think!